Emergency Mass Notification Systems (EMNS) are essential for communicating to large audiences during and after a crisis. However, there is no reason they cannot also be used for regular mass communication. 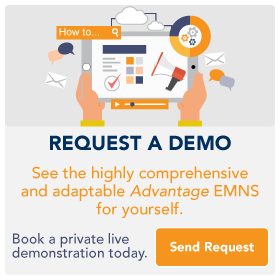 While not ideal – and sometimes prohibited – for marketing purposes, an EMNS can help provide a single system and interface for organizations to communicate many different types of messages. Spring 2017, floods have caused devastation across Canada. The damage is extensive, and water levels in some areas reached unprecedented heights. Communities all across Canada and especially in British Columbia’s Interior, the Ottawa Valley in Ontario, and over 170 communities in Quebec were on high alert, as the rain poured if for days. Thousands of people were evacuated, and the list of road closures was incredibly long. The hashtag #flooding2017 was and is trending, full of distressing images and stories. In the last century, there has been a marked increase not only in the number of natural disasters but in their total damage costs. Whether these are the result of human activity, climate change and global warming or a normal shift in the planet’s evolution is still debated. Regardless, there is little doubt that organizations must deal with the consequences that these natural incidents have on day-to-day operations and most importantly, on the safety of their employees. Bomb Scare at Concordia. Emergency Mass Notification Done Right. Thankfully, there were no bombs, and no one was hurt. But no one knew that when the threat was first identified. When instructed by police, Concordia University was able to use their emergency mass notification to rapidly deploy messages via desktop, digital screens and text messaging to evacuate three buildings in an effort to keep students, staff, and visitors safe from harm. In a large organization, choosing a provider for a mass communication tool, or any other solution for that matter, is not a simple task. Often times, there is a bidding process where vendors respond to a Request for Proposals. Now, producing the RFP in the first place is extremely complex. You have to factor in all the possible functionalities the solution should have for any possible disaster scenario you can conceive. And even when this comprehensive and exhaustive list is on put paper, there is still crucial information that can’t truly be captured. Often, it’s these details that make all the difference between a vendor that you keep and one that you want to get rid of. Social media has created a need for real-time information, as a result when a crisis happens it is imperative that organizations respond quickly. Cision Canada recently published a blog outlining the four keys to emergency crisis communications. The Canadian government announces the fourth installment of the Canada-U.S. Enhancement Resiliency Experiment, known as CAUSE IV, which occurred in April of this year. As recently reported by the Edmonton Sun, social media became the unofficial emergency broadcast system of the Fort McMurray fires. During and after the evacuation, when even the radio stations went silent, citizens fleeing the fires as well as people wanting to know more about the fires scanned social media for news during the crisis. Have you promoted your emergency mass notification system? You should. Determined the different user types your system will support as well what security/permissions each user type will have. Confirmed how to get your user/stakeholder information into the system...either via upload, integration with another software platform, or via self-registration of your users. Set-up user groups, uploaded important crisis communication related documents. Integrated your ENS with various external notification devices such as digital displays, sirens, and desktop disruption. Tested the system, and more. But did you promote the new “service” your organization is providing to the stakeholders in your database? Did you build enthusiasm and buy-in from your stakeholders? ERMS had a great quarter! With an increased demand we have been busy. Busy training new customers and helping them implement their new system. Just how busy? VERY! Our quarterly sales results were almost 50% above target. Some of our newest customers include: Canadian Red Cross, Desjardin, Intact Insurance, Simon Fraser University, Worker’s Compensation Board of Manitoba (WCB), British Columbia Emergency Management (EMBC), the City of Cambridge, Canadian Federal Government (Shared Services), Independence Bank, Jewish General Hospital, and many more.